Hello everyone and welcome to the very first Holiday Blog Hop on Crafty Wife! Today, eight fabulous bloggers are joining together to bring you (our lovely readers) our must-have items for this holiday season. (You can find the links to all of our lists in one easy-to-find place: here.) So pull up a chair, grab a cup of coffee, and get ready to do some blog hopping and holiday shopping! And, keep on scrolling because we have a fun giveaway at the bottom of the post! Chris and I are big into gadgets at our house. We love strolling through Best Buy, eyeing the new electronics and silently keeping track of all the things we’d love to have in our possession someday. I guess you could say we’re technogeeks. The two of us get so excited over any new technology that comes out. Last year when Disney Infinity hit the shelves Chris upgraded to the Wii U just so we didn’t have to get the game on the old Wii system. Yea, we’re cool like that. 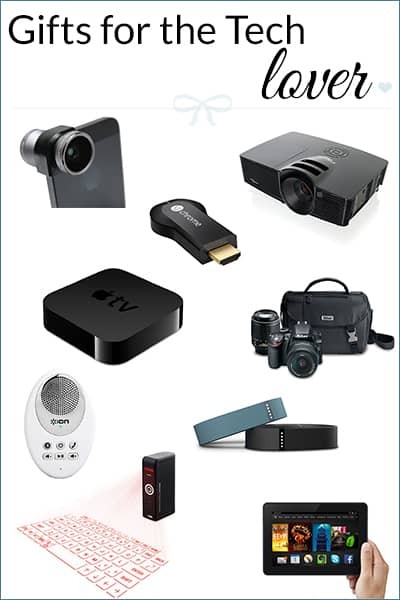 So I thought I could bring you a gift guide of all the fun gadgets that Chris and I love. Are you ready to geek out with us? 1. Fitbit Flex Wireless Activity + Sleep Wristband . I bought Chris a fitbit last Christmas and it is the coolest gadget he owns! Not only does it track how you sleep and how much you exercise but it also transfers all the data to your computer so you can keep track of your progress. We use his fitbit every time we got to Disney and we’re always surprised at how active we are while there! 2. Kindle Fire HDX . So, I’m kind of in love with my older generation Kindle, and think it’s probably my favorite gadget that I own. Mostly because am a book hoarder and love to read, like I wrote about here. With the newer generation of Kindles you can also watch tv and movies so there are things on it for those who aren’t as into books as I am. But seriously, why would you use a Kindle for anything other than reading? 3. Google Chromecast . My little sister got my husband this for Christmas last year and it is awesome! We can now watch Netflix on the tv in our room because of it so when I’m laying in bed at night and don’t want to go to sleep I can torture my husband with hours upon hours of Gilmore Girls and The Vampire Diaries episodes. 4. DSLR . By now you’re probably aware that I love my Nikon. I may even go as far as saying that I am obsessed with it. I honestly believe that if you are into photography at all (or even thinking about investing in a nice camera) you should upgrade and learn how to take amazing photos. And while you’re looking at nice cameras you should also look into this book, Understanding Exposure , to start you on the path to picture bliss. 5. Home Theater Projector . So, this is definitely one of the more expensive gadgets on the list but if you are dreaming of an in-home theater system this is a must have. Chris and I cannot wait to own our own home just so we can convert our basement into a media room. I’m sure there will be lots of Harry Potter viewing parties once we have one! 6. Wireless Waterproof Speaker . Who doesn’t love singing in the shower? I mean, you may not want to admit it but I’m sure you do it too, just like me! But, unless I bring my entire laptop in the bathroom with me (not likely) I have a hard time hearing my music over the running water. That’s why I’m all about the waterproof speakers that are bluetooth enabled so I can listen to my music and soak up all the hot water by the time my husband has to get up and get ready for work. 7. Olloclip Lenses for iPhone . If you’re not ready to invest in a DSLR but are still interested in taking better pictures you should check out these olloclip lenses for your cell phone! You can enhance your cell phone pictures with a fisheye, macro, or wide-angle lens. Just a warning though, it doesn’t look like they have them for us iPhone 6 and 6 Plus users just yet! 8. Apple TV . We love our Apple products something fierce in this house! And honestly, when we heard about Apple TV a few years ago we were pretty excited. You can watch Netflix, stream movies, shows, and music from you iPhones and more with it! 9. Virtual Keyboard . It’s a laser keyboard. Yep, laser. Need a keyboard for your tablet? Check. Want to use a keyboard for your Apple tv? Check. Seriously, this is genius. It works well on smooth, flat surfaces and it’s great because you can carry it pretty much anywhere. What’s not to love? 10. Travelpro Briefcase . Okay, so this is definitely not a gadget but it is on my must-list just the same. Did you know that companies are now making TSA approved laptop bags so that you don’t have to take your computer out when going through security? Chris showed me this a few months back and I think Santa may be bringing him one for Christmas. It is perfect for those who travel often and dream of smooth sailing through those horrible security lines at the airports! I’m linking up with seven other awesome ladies and would love for you to check out their gift guides as well! And now it’s time for the giveaway! I want to thank these amazing bloggers for co-hosting with me and making this giveaway possible! Along with teaming up to bring you a week of gift guides for the holiday season, a few of us are also teaming up to bring you a great giveaway! Be sure to visit each one of these ladies and show them some love by clicking on their links below! This giveaway will be open from 12am EST November 17th to 12am EST November 24th, and open to US residents only. Good luck! Some of these are definitely items on our wish list once we move out of our apartment, especially the home theatre. I am asking for a new lens for my DSLR this year. We are dreaming of a home theater once we get out of our apartment as well. Living in an apartment really limits what you can have tech wise! haha I’m also asking for a new lens for my camera, which one are you asking for? We love our Apple TV! This is a great list! You have so many awesome things on this list! I’d love to have that waterproof speaker and the virtual keyboard. So cool! My list has a new camera, and some goodies to go with it … (I’ll be re-reading your post on that in a minute 😉 ). I love the computer bag idea! It’s so versatile, if you travel, or just take your computer with you ever, it’s a great thing to have. Being airline friendly is a great plus, and the bag looks roomy enough to hold a lot of tech gear when you travel. I will have to look into one for our family for when we travel. I would like a juicer for Christmas, or maybe a new winter coat. I need a new winter coat as well, Kelly! What a great list! You know what’s realllly on my Christmas list, but I won’t be asking for that for real 😉 I really want a Silhouette portrait though!! I think we are just on the same page today! First, coffee, now this! The DSLR camera is the exact one I asked for for next Christmas! Big purchases like that take a year to save up for. Plus, I already got my Christmas present this year in the form of a second dog. What other DSLRs did you look at before getting the Nikon? I am also considering some Canon options, but I used to have a film Nikon and loved it. They are a big name in the camera market for a reason. We are! haha We did the same thing with my camera because that’s definitely not a spur of the moment purchase! My husband actually did all the research on different cameras and it was between my D3200 and a Cannon T5i (I think that was the one that had just come out two years ago…). Both are great starter cameras to be honest but the reason I went with the Nikon was because it’s super lightweight and I loved the features it came with and the specs on it. You can’t go wrong with either camera, but I’m a Nikon girl all the way so that’s what I ultimately went with. The only item on my list is to have my son home for Christmas. That’s so sweet. I hope it happens for you! You don’t have to be a techie to love electronics! haha Apple TV is great! Love the Kindle! I think they’re on sale right now on Amazon…. I love this collab you guys are doing! Who doesn’t need Christmas gift ideas! Thanks, Adele! I agree, I need all the help I can get with gifts sometimes! These are awesome gadgets that you shared and the waterproof wireless speaker catches my attention most. Thank you for sharing this list, it is great. Thank you for checking out my list, Kata!